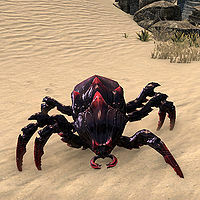 Assassin Beetles are hostile, large insectoid creatures found across Tamriel. They are six-legged, have a hard exoskeleton, and are dark-colored (often with red markings). Upon being killed, they exude poison that will harm anyone that comes too close. Ability that activates upon its death. This page was last modified on 8 July 2018, at 06:55.